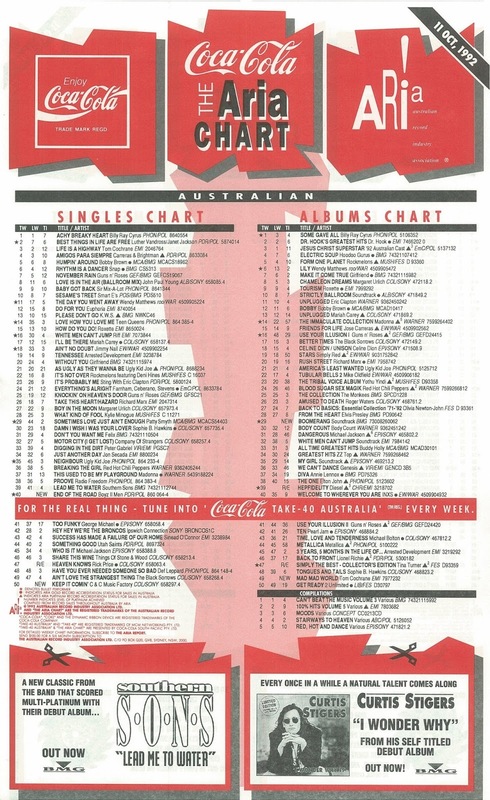 1992 really was a year for big ballads - and they didn't come much bigger than the song making its debut on the ARIA chart this week that year. An emotional ballad written and produced by one of the biggest teams in the business, it made itself at home at number 1 in Australia for a month, which was actually a fraction of the time it spent on top in the US, where it broke the record for the longest chart-topper. In Australia, our new entry would also go on to have the honour of dethroning Billy Ray Cyrus from the number 1 spot. This week in 1992, "Achy Breaky Heart" spent its second week on top. They'd been chart-toppers themselves just four months earlier, but rap duo Kris Kross scraped the bottom of the top 100 with their Sammy Davis Jr-sampling third single. They changed their name (from Killing Time) and their chart fortunes (previous release Dream Alone made the top 30) with this single released contemporaneously with debut album Mossy God. Don't let the string quartet intro fool you, Extreme were back to their hard rocking ways with this lead single from third album III Sides To Every Story. Just as "One Love/People Get Ready" had promoted Legend eight years earlier, so too was this early-'70s song issued as a single in support of the Songs Of Freedom box set. I didn't see this coming. After four hits from debut album Gonna Make You Sweat - including two top 10 singles - and another top 20 placing with a release as Clivillés & Cole, I would've thought it'd be a given that a brand new song from C+C Music Factory would do well on the chart. But despite being another catchy rap-sung concoction, this single from the soundtrack to the original Buffy The Vampire Slayer movie tanked. Vocals for "Keep It Comin'..." were handled by Deborah Cooper, who'd performed on C&C's remake of "Pride (In The Name Of Love)" and "A Deeper Love", and rapper Q-Unique filling the position previously held by Freedom Williams. While Australia had previously taken to C+C Music Factory with almost as much enthusiasm as America, Boyz II Men hadn't received the same sort of warm reception locally. To date, only one of their four Billboard top 50 hits, "Motownphilly", had made the same section of the chart here - and then only at number 32. But the vocal harmony group made up for lost time with a song that was also a brand new recording taken from a film. Written and produced by LA Reid, Babyface and Daryl Simmons, "End Of The Road" was included on the LaFace soundtrack to Eddie Murphy's Boomerang. 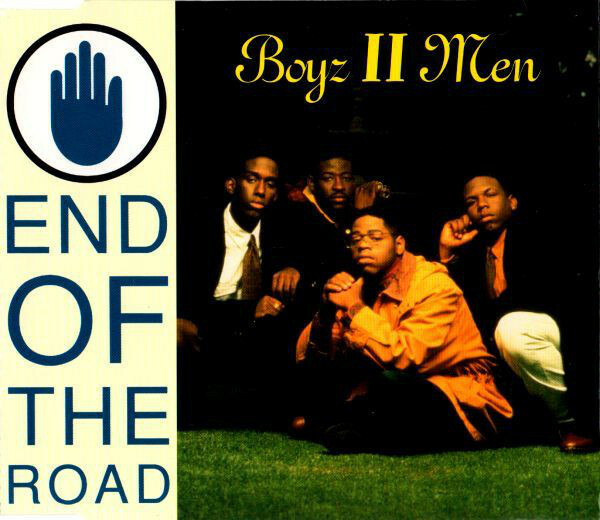 The heartfelt song about the conclusion of a relationship was originally going to be performed by Babyface himself, but Boyz II Men were approached when it was decided it'd suit them better. Indeed, it's hard to imagine the ballad being sung by anyone but the four-piece, who wailed all over the track in what would become their trademark style. 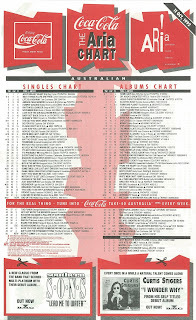 A four-week number 1 in Australia, "End Of The Road" stayed on top for 13 weeks in the US, beating the record long held by Elvis Presley's 11-week chart-topper, "Don't Be Cruel / Hound Dog". For me, who'd been a big fan of Boyz II Men's debut album, Cooleyhighharmony, to which "End Of The Road" was added, the song was too plodding and depressing. I can see why it was massive, especially at this time of year, but it just felt so overwrought compared to their earlier releases. Next week: follow-ups to two number 2 hits, plus the first post-Guns n' Roses chart appearance by a former member of the band. As someone who has a relative good tolerance for music and has a very eclectic listening taste, finally a genre of song that was coming more prevalent in the charts was a genre I could not stand. I like Motownphilly but really disliked nearly everything else BoyzIIMen released. BoyzIIMen, R.Kelly, Jodeci, yuck. Funnily enough I didn't mind the likes of Mariah Carey singing a similar type of music. Go figure!! Yeah, I'm with you on that one Finn. "Motownphilly" was a cool song! But then they realized they'd do better with all this slow-jam slop. Eurgh! And sorry to be so nit-picky, but I'm a graphic designer and the typography on the "End Of The Road" single cover is awful. The "OF" being larger than the other words? That hand in a circle? What were you thinking, LaFace Records. Although it's lacking a tune a bit, I prefer 'I Missed the Bus' to 'Warm It Up'. I don't think I'd heard the Extreme track before, and, to my surprise, it's better than I was expecting. Still not good enough though for me to want to hear it again. It's odd that the music video for 'Iron Lion Zion' isn't on YouTube, unless it's blocked. Personally, I hated the soooo sappy-sweet sound of Babyface/Reid-produced ballads like 'End of the Road'. I also liked 'Motownphilly', but not the direction Boyz II Men took from this point onwards. This style of music, to me, was so bland. I was/am a big fan of the Extreme track. It was on heavy play on triple J at the time. I went back through BoyzIIMen discography and did find I liked their cover of In the still of the Night, but nothing else.